Most of the famous television personalities without being hesitant, share all their blissful moments and recent activities in the media, mostly for popularity and high rates for their shows. However, the same cannot be said for the beautiful and charming meteorologist for WTTG-TV FOX5, Caitlin Roth. Although Caitlin has always avoided many queries about her relationships and private affairs, there was no escaping at all and finally, we found out that Caitlin has already been married to her own co-host of the show FOX 5 News Morning and Good Day DC, Mr. Tucker Barnes. Shocking, isn't it? Let's find out more about the mysterious love story of the couple. Are Caitlin Roth and Tucker Barnes Married? Caitlin who has been working in FOX5 News Morning and Good Day DC since 2015, along with her co-host Tucker Barnes is a happily married woman. Lately, she has been busy going out for a romantic honeymoon and private outings with her amazing husband Tucker. As per sources, rumors of Tucker and Caitlin having an alleged affair has once swirled up in the media but it soon got out of the picture. However, who knew that the duo was in love with each other so deeply that, they finally decided to tie the knot officially and be together forever. This information was revealed when Caitlin posted pictures of her and her partner stating that they are going on a honeymoon together. Also, Caitlin and Tucker both have posted a lot of photos of them traveling. Well, all in all, it's clear that the duo is hopelessly in love and are having the best times of their life. Here are some of the Instagram posts of them getting cozy and romantic together. 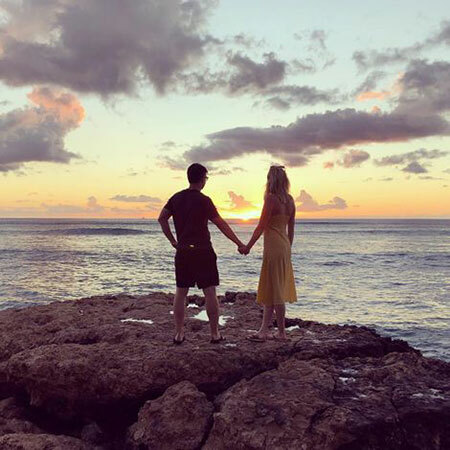 The lovebirds celebrated Valentine's Day 2019 sharing an image of the duo holding hands while enjoying the beautiful sunset. Caitlin Roth and Tucker Barnes Celebrating Valentine's Day. "Sharing the love late on this #ValentinesDay with my @tuckerbarnesfox5 here’s to a million more sunsets..."
We are so happy to look at the lovely duo and we wish to see them together till the end. How did the couple first met? The two them first met on the sets of FOX news channel, where Tucker was working as the host of the show FOX News Morning and Good Day DC and Caitlin has just joined the team member as the morning weather reporter/meteorologist. They might have got along well together as both have similar interests of the career as well as the passion for weather. Discover: Is Meteorologist Vera Jimenez Married? Who is her Husband? Eventually, they started dating for quite a long time and finally got married secretly, without involving media and paparazzi. In addition to this, there has not been any news regarding Caitlin getting pregnant and having a child and it's obvious that divorce for this couple is out of the picture. Well, they are doing very well in their career and their married life is also going smoothly toward the right track. We wish them to have all the happiness that they deserve.